What do hjust and vjust do when making a plot using ggplot? 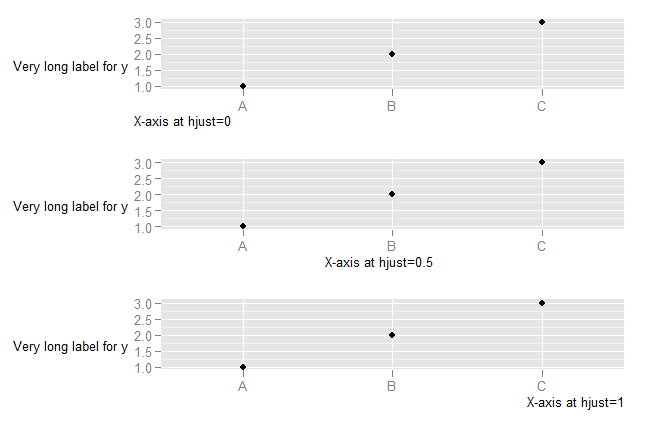 to get the axis labels to line up where the axis labels almost touch the axis, and are flush against it (justified to the axis, so to speak). However, I don't really understand what's going on. Often, hjust = 0.5 gives such dramatically different results from hjust = 0.6, for example, that I haven't been able to figure it out just by playing around with different values. Can anyone point me to a comprehensive explanation of how hjust and vjust options work? hjust controls horizontal justification and vjust controls vertical justification. 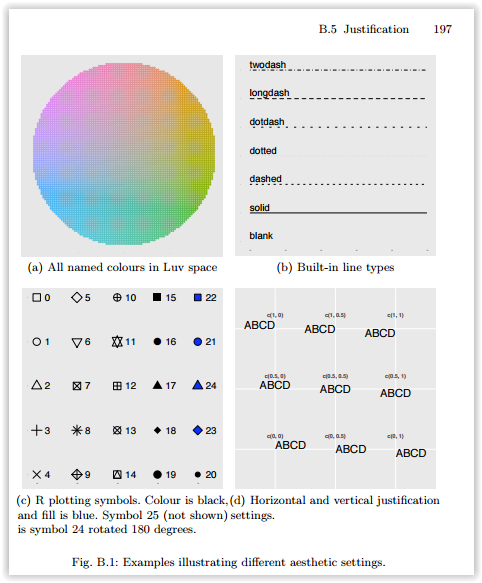 Probably the most definitive is Figure B.1(d) of the ggplot2 book, the appendices of which are available at http://ggplot2.org/book/appendices.pdf. However, it is not quite that simple. hjust and vjust as described there are how it works in geom_text and theme_text (sometimes). One way to think of it is to think of a box around the text, and where the reference point is in relation to that box, in units relative to the size of the box (and thus different for texts of different size). An hjust of 0.5 and a vjust of 0.5 center the box on the reference point. Reducing hjust moves the box right by an amount of the box width times 0.5-hjust. Thus when hjust=0, the left edge of the box is at the reference point. Increasing hjust moves the box left by an amount of the box width times hjust-0.5. When hjust=1, the box is moved half a box width left from centered, which puts the right edge on the reference point. If hjust=2, the right edge of the box is a box width left of the reference point (center is 2-0.5=1.5 box widths left of the reference point. For vertical, less is up and more is down. This is effectively what that Figure B.1(d) says, but it extrapolates beyond [0,1]. The first has the labels left justified (against the bottom), the second has them centered in some box so their centers line up, and the third has them right justified (so their right sides line up next to the axis). The last one, well, I can't explain in a coherent way. It has something to do with the size of the text, the size of the widest text, and I'm not sure what else. Not the answer you're looking for? Browse other questions tagged r plot ggplot2 or ask your own question. 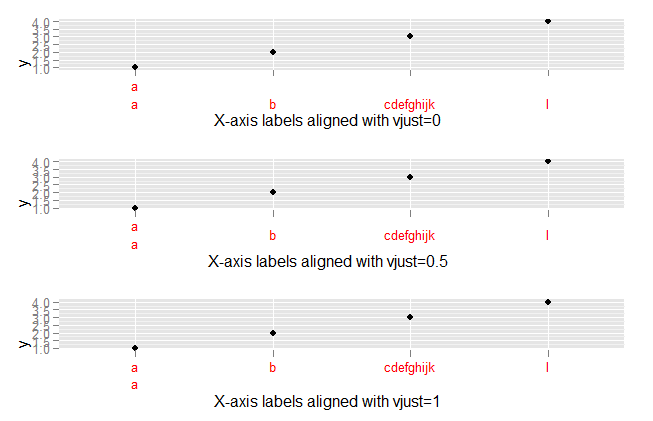 Does ggplot's vjust of axis.text depend on angle? How to display the median value in a boxplot in ggplot? 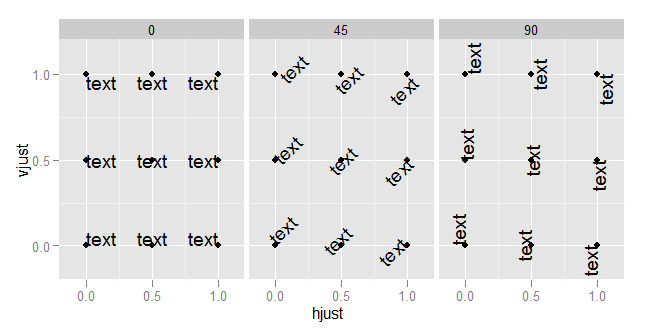 R ggplot2: how to write the y coordinate of every data point right next to it? How do I shift axis labels to the left so that they are aligned with tick marks? Can one apply vjust in ggplot's element_text to individual tick mark labels?